I think, maybe, after your interaction with the lovely pharmacist, you wanted to get your hands on that paddle. Good answer. I’m not really a violent person, but who knows . . . what evil lurks in the heart of men . . . no, wait. That’s The Shadow. See you soon! The last time I took any Vicodin was after my hysterectomy for cancer. I had don’t remember sleeping, but I do remember having what seemed like a wide-awake dream – very strange dream about corridors and empty meeting rooms. I think it was from wandering around the hospital with its long, empty corridors. Doesn’t sound disturbing but it really was. Best not to take that stuff, I think. I had Vicodin once years ago after a jaw surgery. I just remember that I slept a lot which I needed to do at the time. This time, the doctor wrote the prescription on a “just in case” chance I had a lot of pain. I was more interested in just getting what I need and getting home. I have had those wide-awake dreams before and they are always frightening. I have them sometimes if I wake tired in the morning and then fall back asleep. By the looks of the kayakers, if they continue to sit where they are, the water (as in tide) will be gone and they will not need their paddles (hence the passage of time and you won’t need the vicodin). So too shall the pain pass)….maybe???? When I took that photo I actually thought of Dennis and how he loves to fish from a boat, and I thought that if he was there he would have laughed at those guys. But I loved the photo itself because of the angles and shapes and the shaft of yellow from the guy’s life vest reflected in the water. Man, I wish I could remember why I put that photo with the thought of the not getting Vicodin. Maybe one day it’ll come to me. Now I have something to ponder when I can’t sleep tonight. Thank you. You’re welcome. I wish you could sleep, though. If I had some fairy dust I would send it your way. Or a lullaby. I’m sure there’s a great story there. To hell with the Vicodin! Let them eat fish! Maybe you were wishing you were enjoying a nice float in a kayak instead of dealing with the Nazi pharmacist (and the pain), Mary. Fortunately, we humans tend to forget pain but maybe in this case you forgot what was associated with it as well (the photograph). I’m sure I had something lovely and profound in mind. 😉 That photo is sooooo peaceful. The colours are such that might occur if you had got enough Vicodin, – or oxycodone, – or mushrooms, – or LSD…….? Ha! Your version sounds like it could be a play by Samuel Beckett. Good one, Andy. First: I laughed out loud over the “lethal burns” sign. Funny! I associate kayaking as soothing and a chance to get away from the cares of the world for a bit (at least that’s what it is for me). So I read this as “to hell with the vicodin; i’ll get relief on the water” (although to be honest, it’d be hard to enjoy the float with pain and swelling after oral surgery). Glad you liked it, Laurie. I didn’t want to let a perfectly good title and a lovely photo go to waste because of my poor memory. 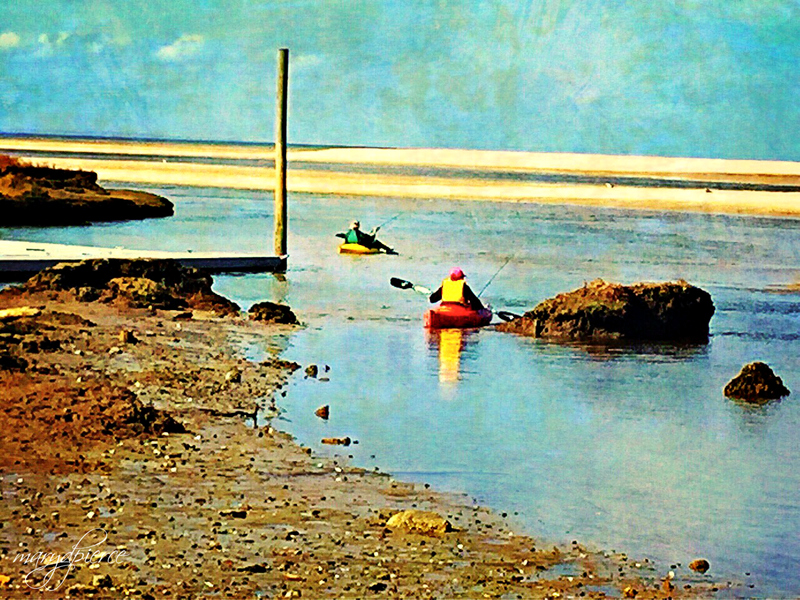 I really liked this photo, I took several from various angles wondering the whole time why these two needed kayaks, and also, what they would catch in such shallow waters. The water was not very deep. I could have walked over to ask them. When I saw the title, I thought it made perfect sense. The picture suggests you find peace and tranquility from gliding on top of the water and taking in nature instead of using the drug. Narcotics typically give you a little lift and a feeling of peace….basically an escape from whatever life is dishing you at the moment. You may have been hoping for an alternative to the drug since it was going to be such a hassle to get it. As it turned out, I probably wouldn’t have used it anyway. Plain old ibuprofen did the trick. You have lovely, creative friends. They make great detectives! Thank you, Paula. And thank you for sharing my post. I appreciate it! I like everybody else’s theories. Love them, actually!! Let this be a lesson to both of us: A little context is necessary. Good lesson! I was just on my mower running thru “3 of cups” again. I’m gonna use it for a writing prompt tomorrow and see what happens. Add in your “5 of dinner plates” and we may have a wonderfully mad tea party! HA! I only got as far as the poker scene at a card table. Goodness…perhaps some scraps of paper should be thrown away! Hm, I’m picturing the unhelpful pharmacist “sleeping with the fishes.” But I really do like Julie Steiner’s interpretation best. I don’t know; that sounds plausible to me. She was a most unpleasant person. She could have used a little Vicodin herself, or at least a peaceful float on calm water and a sunny day. Hahahahahaha! This was hilarious! Thanks for sharing it! Glad you enjoyed it, Mimi. Thanks for reading and commenting! I’m thinking maybe i’d rather be paddling on that water than driving 70 miles round trip. 🙂 It’s a beautiful photo–makes me feel calm looking at it. Me, too, Coleen. Driving always makes me tense even in the best circumstances. Floating on water though . . . lovely. Thanks! Funny you mention this, Mary, because I was yesterday looking at some old writings of mine (some of them well older than a decade) and some of them made zero sense. In a way, I’m looking at the work of a stranger, and that’s a little weird and a little liberating, I guess, in a way, because you know that you (not to mention your art, your outlook, your appearance, etc.) can be transformed over time–and, moreover, it will be, frankly, whether you want to or not. As for the photo, to me it looks like the closer paddler is maneuvering around a rock; perhaps you meant your draft to be about how we paddle around the nagging, poking, painful ‘rocks’ that fate (or whatever) decides to strew about our lives. Anyway, good post . . . I believe Twain advised a similar thing (that you should stop writing mid-sentence and that will help jog your memory when you come back to what you’re working on). Older than a decade — that must be an odd sensation. I recently found some poetry I had written two decades ago, but that’s an entirely different thing. The fear of coming back to old writing used to stop me from writing much at all when I was younger. Most of my friends and both my sisters kept diaries or journals as teenagers, but I couldn’t bring myself to do that. Blogging scares me more than I can say. You’re right about Twain. I remember that quote now. Good advice. Hey maybe it was just thinking of a happy place while in pain…..just to get past the moment. I can often visualize a place or memory that helps me get past something not quite so pleasant. Well at least it has provoked a lot of surmising and comments, I have enjoyed reading your blogs. Thank you so much for reading and commenting. I appreciate it. Whatever my original plan, I like your idea of visualizing a place or memory to get me past an unpleasantry. I’m going to give that a try. Maybe even with the photo about because it is calming. Thank you!